1 of 5 Divide marshmallows into 24 groups of 14 marshmallows each (336 total). 2 of 5 Starting with one bunch of marshmallows, use kitchen shears or scissors to cut each in half diagonally. Dip cut sides of 14 of the marshmallow halves in a light-colored sparkling sugar. Dip remaining 14 halves in the darker companion color of sparkling sugar. 3 of 5 Spread top of one cupcake with frosting. Press flat side of each marshmallow half into frosting, alternating light and dark colors in concentric circles on cupcake. 4 of 5 Repeat with remaining cupcakes. Arrange cupcakes on a platter to resemble a bunch of cut flowers. 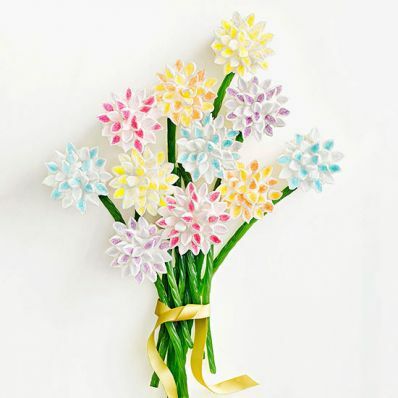 Place green-apple-flavored candy sticks or candy string, tied with a ribbon, to resemble flower stems. 5 of 5 If desired, add green leaves to each cupcake: Snip 2 marshmallows in half diagonally. Dip cut sides in green sparkling sugar. Randomly attach to cupcakes, tucking under outer petals.